In John Steinbeck’s classic novel, The Grapes of Wrath, the Joad family finally reaches the end of its rope. 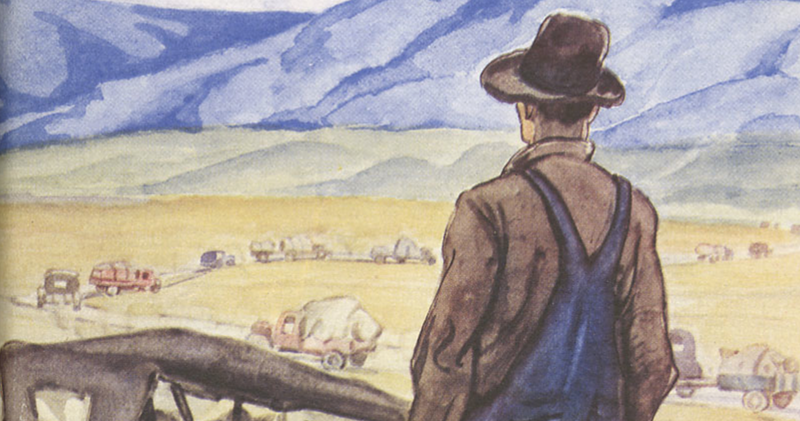 Setback after setback, loss of their livelihood, and finally, loss of their land force the Joads to reluctantly leave the only home they have ever known for the promised land of California. Oklahoma proves to be as indifferent to their absence as it had been to their presence. The Joads quietly leave everything they have ever known behind, but as backward and misunderstood as they and the countless other Okies were, they never left their dignity. They never once presumed the world around them would bend to their needs. It may be 2017, but much of the world still sees our noble state through the Okie stereotype. We are a fly-over state, insignificant and backwards . . . a place of noble victimhood. We have become the Joads, not because others have branded us Okies, but because we have resigned ourselves to suckling our providers in the abandoned barns of misfortune. We are a state rich in resources, strong in character, and unrelenting in resolve. We have traded that strength for a cheap stoicism. We have become caricatures of the caricatures created so long ago by a pretentious Californian, but the current state of Oklahoma need not be the enduring state of Oklahoma. Our next generations deserve better than fatalistic surrender to the self-fulfilling prophecies of a boom-bust economy. We are not bound to the past; rather, we choose to cling to that which we have known – the way of the Joads – motivated by a misguided fealty to suffering as a rite of passage. Our challenges may be unprecedented, as some have suggested, but I cannot imagine them worse than the challenges overcome by the generations before us. Oklahomans are by nature independent, self-reliant, and more than a little stubborn. When things get tough enough, our Wrath kicks in, and we either deal with it or we quietly move on. Oklahoma educators are cut from the same burlap. Your classroom teachers and school support professionals have endured a lot in recent years, and will continue to endure . . . until one day they won’t. When they cannot take anymore without sacrificing their dignity, they will quietly move on to something else or somewhere else. Oklahoma teachers are following in the Joads’ dusty footsteps. As intimately as they love this state, other promised lands beckon. As quietly as Ms. Joad and Mr. Joad plied their trades in our Oklahoma schools, they have been quietly leaving. And just like Steinbeck’s Okies, the Sooner State is as indifferent to their absence as it was their presence. If you get a chance any time soon, pick up a copy of The Grapes of Wrath, or catch the movie. It’s worth the popcorn. For another option, just visit your local public school to see a modern version unfolding right before your eyes. Today's Joads, however are neither destitute nor uneducated. They have options and will reluctantly go where leaders acknowledge their value and loyalty. None of us educators are naïve, this is not a problem which can be solved overnight, but neither has it been a problem which evolved overnight. Past Oklahomans may have endured the Dust Bowl, but they spent that time addressing the causes so their children would never suffer such calamity again. Our state suffered from the mass exodus of Okies during The Great Depression, but in the end, we will suffer much more from the current Okie exodus. Oklahoma educators are choosing to follow the Joads because Oklahomans can give up a lot, but they will never give up their dignity. And unfortunately, our school professionals are losing hope that our state leaders will abandon the past in order to meet needs of the next generation.